condition specifies a condition to test at the start of the WHILE loop. condition is any Expression returning a BOOL value. Statement specifies a statement to execute inside the loop. statement is any Structured Text Statement. If the condition is false when the WHILE Statement starts execution, the statements inside the loop will not be executed. If the condition is true when the WHILE Statement starts execution, the statements inside the WHILE loop are executed until the condition becomes false. To stop the WHILE loop early (before the condition becomes false) use the EXIT Statement. The condition (A) is evaluated. 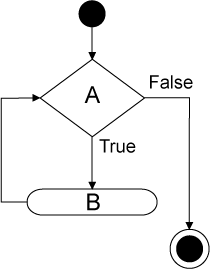 If the condition (A) is FALSE, statements (B) are skipped and the loop is complete. Otherwise the condition (A) is TRUE and statements (B) inside the loop are executed in order. Execution continues with step 1. For information about another loop type that uses a condition. For information about another loop type that uses a fixed number of iterations. To learn about expressions that can be used as the condition in a WHILE loop.